ME/CFS Australia (SA) Inc supports the needs of sufferers of Myalgic Encephalomyelitis, Chronic Fatigue Syndrome and related illnesses. We do this by providing services and information to members. ME/CFS Australia (SA) Inc aims to keep members informed of various research projects, diets, medications, therapies, news items, etc. All communication, both verbal and written, is merely to disseminate information and not to make recommendations or directives. 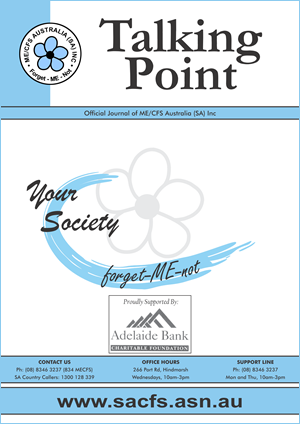 Talking Point is a quarterly magazine produced by ME/CFS Australia (SA) Inc. It provides members with news, coming events, reports of medical research, and much more. M.E. : All in the Brain? Study: How is memory and concentration affected in CFS? Genes and chronic fatigue: how strong is the evidence? Harvard Health Letter: any help on the horizon for chronic fatigue syndrome? Is CFS a brain disorder? Annual General Meeting, by Peter Mitchell. Influenza vaccination – is it appropriate in Chronic Fatigue Syndrome? Disability Support Pensioners Australia Inc.
How Significant are Primary Sleep Disorders and Sleepiness in the Chronic Fatigue Syndrome?